Maj. Roger G. B. Broome, USMCR, died from wounds received on Saipan before his daughter had a chance to know him. Now a well-known naval historian and author of award-winning books, that daughter, Kathleen Broome Williams, has turned the research skills she honed studying naval technology to find her lost father. For this biography, she makes full use of an extensive collection of her father's colourful and articulate letters along with the testimony of surviving Leathernecks who served with Major Broome, backed up by official records. The book reconstructs her father's life as a University of Virginia Law School graduate who obtained a commission in the Marine Corps despite his colour blindness and eventually won the combat command he lobbied for. In April 1944 Broome took command of the Regimental Weapons Company, 24th Marines, 4th Marine Division. But his pursuit of glory came to an abrupt end just twenty-four days into the Saipan invasion when he sustained the wounds that condemned him to a lingering death. The author not only found a hero who was awarded the Navy Cross for his courageous actions, but also uncovered a profoundly human individual with strengths as well as obvious faults. In unfolding Broome's story, she takes significant world events from seventy years ago and places them in an intimate context, to show how they affected Americans on and off the battlefield. 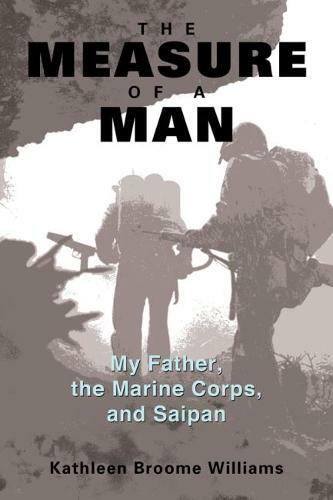 Her efforts provide an inside look at the U.S. Marine Corps during the pivotal years of World War II, including recruit training, amphibious assaults, high casualties, and, not least, the personal feuds and rivalries that shaped it.